As adults who have undergone teeth straightening procedures ourselves, our dentists and periodontists at Trillium Dental in Ottawa know just how difficult it can be to pursue braces as an adult. There are many reasons why this is so, and we’ve heard them all time and time again. For many adults, braces cause a level of discomfort and self-consciousness that no one wants to experience during adulthood. Yet, these things shouldn’t keep you from obtaining a beautiful smile that you can feel confident about for the rest of your life. We’ve all heard the stereotypes about braces: they’re dorky, they hurt, they’re meant for teenagers, everyone will notice them — the list goes on. In reality, it is perfectly alright to need braces as an adult, and no stereotype should stand in your way of seeking the dental care you need. However, recent technological advancements in the field of dentistry have made it possible for adults to be much more discreet about their teeth straightening processes. One of our all-time favorites is Invisalign®. Invisalign is similar to traditional braces in the sense that it serves to straighten your teeth over time, providing you with a stunning smile as the end result. However, Invisalign retainers are clear and nearly invisible to others, making them a far more appealing option for older adults. In addition to these “clear braces” being hard to notice, the process of straightening your teeth with Invisalign is also quicker, more comfortable, and more convenient. Here’s how it works! Upon meeting with your family dentist to talk about the possibility of getting Invisalign retainers, we will take X-rays of your teeth in order to determine exactly what needs to be done. If you have an overbite, underbite, or crowded or gapped teeth, for example, we can customize your aligner trays to serve these unique needs. This customized series of teeth straightening trays will also include instructions for you to follow, as the first tray will be replaced with the next one once your teeth have made that micro-shift, and so on and so forth, until you have reached the end result after 15 months. You might be wondering how you’d manage to eat and drink with a clear plastic retainer in your mouth at all times, and you’ll be pleasantly surprised to know that they are removable. Before sitting down to eat, be sure to take your retainer out, as it is not meant to be kept in your mouth as you chew. Be careful though — two of the main drawbacks of Invisalign are the temptation to take it out too often and the tendency for people to forget to put it back in after eating. 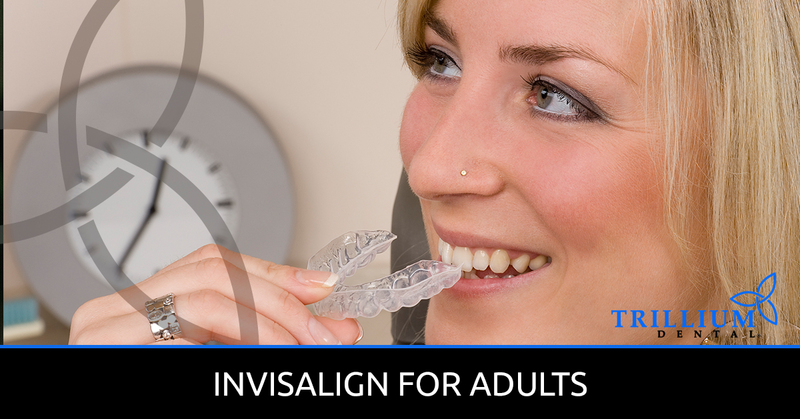 Why Do Adults Choose Invisalign? Invisalign sounds pretty great, right? As previously mentioned, part of the reason why so many adults love Invisalign is the fact that they are nearly invisible to others. The last thing working or otherwise busy adults need is to have the stereotypes associated with braces interfering with their daily lives. After all, the motive behind getting braces is to obtain a beautiful smile you can feel good about, so it’s only natural that you wouldn’t want people staring at obvious metal brackets on your teeth. With Invisalign, not only will be happy with your teeth after the work is done, but you also won’t hesitate to smile along the way! Another thing that makes Invisalign a great alternative for adults is the fact that they are far more comfortable to wear than traditional braces. As professionals in family dentistry, we’ll be the first to say that braces aren’t always painless; in fact, they can cause a great deal of discomfort at first. With Invisalign, you won’t have to worry about dealing with noticeable metal brackets that rub against the inside of your cheeks and cause irritation. Invisalign retainers are so thin and snug that you’ll hardly notice they’re there! Not only that, but any discomfort you feel with Invisalign will only occur for a day or so after you move on to each new retainer, which is a much smaller micro-adjustment that happens every two weeks. Compared to traditional braces, where you must visit your dental office to have your wires manually tightened every six to eight months, the micro-adjustments of Invisalign retainers are far easier to acclimate to. When worn diligently for 22 hours a day, seven days a week, Invisalign will leave you with perfectly straight teeth in just 15 months, as opposed to the somewhat unpredictable commitment of braces, which lasts anywhere from 18 months to over two years. If you are an adult who needs braces and you don’t want to deal with obvious, sometimes irritating metal brackets, Invisalign is for you! There has never been an easier, more discrete way for adults to transform their crooked teeth into a stunning, youthful smile. All you have to do is schedule a consultation with your dentist, let them set you up with a set of customized retainers, and wear them as instructed. The 15 months will fly by and you’ll have a perfect smile in no time! Our dentists at Trillium Dental in Ottawa have provided many adults with customized Invisalign retainers that serve their unique needs and give them the smile they’ve always dreamed of. And the best part is that we can help you, too! Simply request an appointment on our website or give us a call today.